Notable features Double sun, huge moon. Population 24 million; Majority Human but with significant populations of all sapient species found in the Verge. New Carolina is a warm Earth-like world with a smattering of small continents and many island archipelagos. It is famous for its tropical beaches and pleasant climate. New Carolina orbits a double sun – one nearly as white as Earth's sun, the other slightly smaller and more yellow-white in color. The binary pair are separated in New Carolina's sky by up to a dozen times the angular size of the larger of the two suns, depending on the orbital orientation of New Carolina to its suns. New Carolina's moon looms huge in its sky, with an angular diameter nearly that of the maximum angular separation of its suns. The moon and New Carolina are mutually tidally locked, so that the moon seems to hang in the same position in the sky at all times. Consequently, it is only visible from half the planet. Two cyclone belts circle New Carolina between 10° and 20° latitude. Due to lack of significant land masses in the southern belt, several permanent cyclonic storms are continually circling the planet, with strengths at least that of the strongest hurricanes of Earth. The northern belt has its cyclone-generating oceans interrupted by one of New Carolina's small continents, which serves to break up the storms as they pass over. Nevertheless, that section of the continent gets hit by several category 5 hurricanes per year. The native autotrophes of New Carolina are orange-red in color. They produce leafy or frond-like foliage similar to that of Earth plants. Many Earth plant species have been introduced, mixing green in with the native red vegetation. Pandanus screw pines, coconut and other palms, sagos, tropical hardwoods, and just about every variety of popular houseplant are all now common in New Carolina's forests, grasses have spread across open areas, and kelp and other seaweed escaped from aquaculture farms are growing in the seas. The native land animal life of New Carolina consists of mostly slug or flatworm-like creatures that glide across the ground, although a few species have taken to gliding through the air as well. 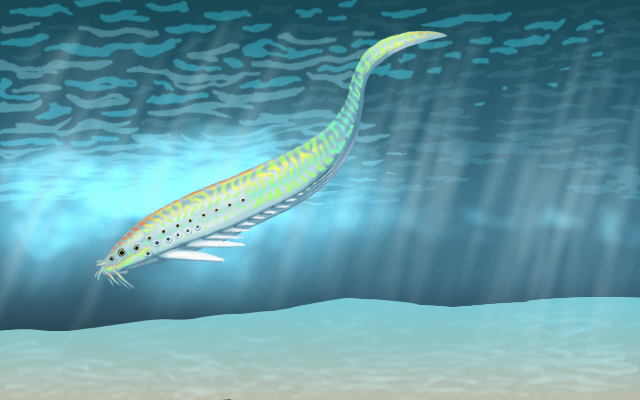 Life in the seas contains not only the New Carolina "slugs" but also various worm-like, tadpole-line, and jawless-fish-like creatures along with arthropods that appear to be related to trilobites and anomalocarids (although they are so highly derived that many scarcely resemble their distant ancestors). Since the arrival of Humans, Earth animals have also colonized New Carolina. The forests are now full of the sounds of cicadas and katydids and locusts, spiders lurk in their webs, and giant Scolopendra centipedes occasionally take up residence in people's shoes when not being worn. Feral hogs root through the undergrowth, goats browse the branches, donkeys graze the forbs and grasses, chickens and turkeys and pheasants of all kinds peck and scratch out a life for themselves, and doves and songbirds add their voices to the insects. Meanwhile, feral cats prowl and feral dogs scavenge and chase, escaped aquaculture species swim and crawl in the seas, and introduced monitor lizards and snakes prey on the pest rats that have made themselves unwelcome visitors across the planet. Probe wormhole flybys of distant icy dwarf planets in the far reaches of New Carolina's star system have shown structures suspected to be Antecessor relics. An expedition to visit one of them is being planned. New Carolina was first explored and surveyed by an American team embarking from Žemyna. The discovery of a shirtsleeve-habitable world attracted considerable interest, and settlers quickly followed. 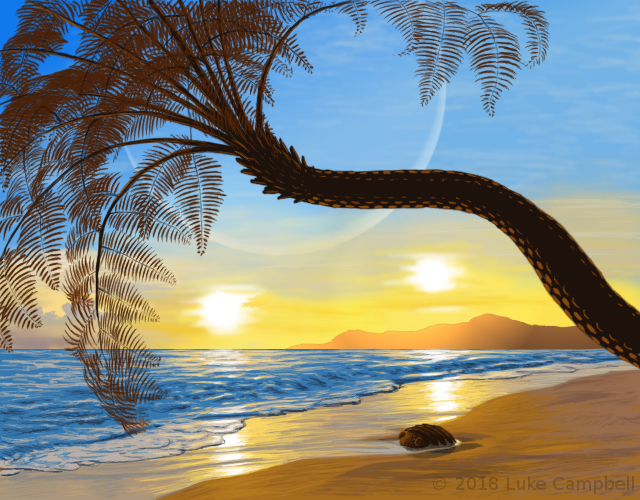 At this time in Earth's history, sea levels were reaching historic high levels, which combined with increased hurricane and tropical cyclone activity generated many climate refugees from island nations and low-lying countries. The United States accepted many of these from Polynesian, Melanesian, and Micronesian islands, the Seychelles, the Caribbean, and Maldives. Combined with extensive flooding and displaced people in Florida, the U.S. Gulf Coast, and the U.S. Atlantic seaboard; as well as unrest and increasing heat and aridity in the middle east; these formed much of the initial settlers of New Carolina. The warm climate and mild seasons made New Carolina a popular place for growing tropical crops. Soon, it was supplying much of the Verge and even Earth with bananas, mangoes, papaya, pineapples, macadamia, cashews, coffee, chocolate, tea, sugar, palm oil, coconuts, sorghum, taro, and yams; with corn, millet, barley, and peas for domestic use. The extensive coastlines encouraged aquaculture. Seaweed farming and ranches growing cobia, seabass, tuna, grouper, snapper, barramundi, pomfret, mullet, pearlspot, shrimp, prawns, crabs, spiny lobsters, oysters, abalone, and mussels became common. With its long coastlines and numerous islands, New Carolina has long had a problem with pirates. Although in time it grew to have one of the larger populations in the Verge, the majority of this population is concentrated in a few areas, leaving most of the planet sparsely settled or wilderness and far from effective law enforcement. In this environment, desperate men and women have taken to raiding commerce and extorting aquaculture villages. During the Chinese occupation, the area around Crystal Creek fell under Chinese control but much of the rest of the planet remained in rebellion. The Chinese were making slow progress in rooting out the troublemakers when the Verge was re-taken by the Americans. A significant set of legends has sprung up around the (often largely imagined) heroics of the resistance during this time. Before The Bump in the Night New Carolina had developed a small but significant manufacturing and software development industry, largely centered around Lewis Bay. A university was established there, the University of New Carolina, to cater to the growing need for an educated workforce. Immediately after The Bump in the Night, this capability was critical to the rebuilding of the Verge, and has allowed New Carolina to become one of the main centers of manufacturing and innovation in the Verge. New Carolina is a member of the Verge Republic. Its internal affairs are regulated by its local government, a representative republican system with an executive branch headed by a governor, a bicameral legislative branch, and an independent judiciary. The politics of New Carolina leans progressive, with high taxes financing social programs such as universal college education, free health care, and a guaranteed basic income. This is largely driven by the high urban population, with rural farmers and aqua-ranchers resenting the high taxes and liberal policies. New Carolina has a strong central marshal service, responsible for law enforcement on a planetary scale such as preventing organized crime, political malfeasance, or terrorism. The frontier marshals are a branch of the marshal service responsible for policing unincorporated territory. In remote areas, sometimes the only law is a frontier marshal who is given wide latitude to carry out his duties. The extensive seas and long coast lines of New Carolina ensure that life in the New Carolina Coast Guard is never dull. The NCCG sees some of the most action of any group in the Verge, rescuing vessels caught in storms, chasing smugglers, and fighting pirates. The humans of New Carolina come from a wide variety of cultures, with significant contributions from the American South, the Caribbean, China, Arabia, Pacific Islanders, Seychellois, and Maldivians. Over the generations, in the more metropolitan areas these Human races have blended to form their own unique population and culture; in the hinterlands you can still find ethnically homogeneous populations with their own distinct cultures and languages. The maritime environment of much of New Carolina has encouraged Laer settlers, who are now the largest population of non-Human sapient species. This same factor led to high populations of Seawolves and Lontras, many of whom have gone feral. Some Pannova settlements exist in the coastal rain forests and montane cloud forests. The main metropolitan areas see traffic from throughout the Verge, and thus have their populations of Mants, Gummis, Tweechis, and Pirangs. The government uses the rather bland sounding name of New Carolina Resident, but everyone calls them Liners. Liners have a reputation for their friendly, laid-back attitude. They value cleverness and innovation, and are often dismissive of regulations, protocol, and tradition (or at least, other people's traditions). Many around the Verge see them as either entrepreneurial tech geniuses or beach bums and surfers. While there is some truth to this stereotype, New Carolina is home to a diversity of cultures. The urban core tends to be more iconoclastic and free wheeling, while the rural areas are more traditional with a deep sense of connection to the land and the heritage of their forefathers. Regardless, Liners do tend to be welcoming and hospitable; and dealing with the variety of cultures comprising modern New Carolina makes them more accepting of the differences of others. Many of the older houses of New Carolina, especially those of wealthier families, are built in a neocolonial or antebellum neoclassical style, harking back to the colonist's Southern roots. Ranch houses and American colonial style houses were also, and remain, popular. The Pacific Islander populations tended to bring their own architectural styles, although they often used modern materials for better durability. Their round houses, long houses, and boat houses, often with wide shady roofs and open walls or wide windows for cross ventilation, can be found across much of New Carolina. Of course, not everyone could afford such nice homes. In the early period, migrants were often housed in tiny pre-fab houses, block apartments, or just wood-and-thatch huts they built themselves, and the poor still use these homes or those of similar styles. The architecture of public buildings in New Carolina is largely influenced by Islamic, neoclassical, and neocolonial styles, although village meeting houses often follow traditional Pacific Islander lines. In the dense urban cores, skyscrapers dominate in order to make the most use of valuable real estate. Mosques are often built using a traditional Islamic style, but churches tend to be more low key and non-descript except for the Gothic-style Cathedral of Our Lady in Crystal Creek. As with most aspects of New Carolina, the food is a blend of its many cultures. From southern-style barbecue and soul food to Polynesian pig roasts and poi, the Liners have taken their diverse heritage, spiced it up with their home-grown tropical agricultural products, and made it something of their own. Well-known dishes include cinnamon banana roast, honey pheasant, taro wraps, and the notorious salted fishworms. Nearly everyone on New Carolina speaks English. Mandarin, Arabic, and Spanish are spoken by many; other languages spoken are Dhivehi (Maldivians), Seychellois, Pijin (Solomon Islanders), Ebon (Marshall Islanders), Gilbertese (I-Kiribati), Kosraean (Caroline Islanders), Nauruan, Tuvaluan, Samoan, Tongan, Cape Verdean Creole, and Halia (Carteret Islanders). There is no one dominant religion on New Carolina. Catholic, Protestant, and Mormon versions of Christianity are common, as is Islam. There is a sizeable Jewish population; African-influenced new world traditions such as Haitian Vodou, Louisiana Voodoo, Hoodoo, and Santería have a significant following; and many of those of Pacific Islander descent practice their homeland's traditional religions. New Carolina also seems to have more than its usual share of odd cults, and has taken the Earth Heritage Revival movement far enough to resurrect various long dead sects ranging from Gnosticism to Slavic Paganism along with others made anew out of whole cloth. A center of high technology development and education, Lewis Bay is also known as a liberal hotbed where people practice alternative lifestyles and "New Age"-style religions; where people scarcely bat an eye at the most extreme body modifications; and where many neighborhoods are notorious for their scandalous night-life. The University of New Carolina maintains its primary campus in Lewis Bay. UNC is one of the leading educational institutions in the Verge Republic, drawing scholars from across the verge. The students tend to be vocal and prone to organizing political rallies for their various (and often obscure) pet causes. The campus, with its expansive green areas, scenic paths, magnificent buildings, fountains, and colonnades is considered one of the architectural wonders of the Verge. As the wormhole terminus to the rest of the Verge, Crystal Creek is the center of New Carolina's interplanetary trade. Crystal Creek is also the hub of the local planetary wormhole network, with branches leading to New Carolina's other major cities. In addition to being a business hub, Crystal Creek is also the location of the largest entertainment industry in the Verge. It hosts a number of major studios, and leads the Verge in the technology and expertise of computational sensory simulation of reality for use in holo-movies and virtual reality. The nominal Crystal Creek itself flows through a greenway and natural reserve cutting across the central and old-town city of Crystal Creek. The Crystal Creek gorge, famous for its enormous quartz crystals, has been left mostly wild, with paths for walking and cycling. The gorge is crossed in multiple places by bridges, connecting the manicured park on either side. The capital of New Carolina, Anton Downs is located in the middle of a rural, agricultural area and maintains something of a small town feel despite being the seat of government.